You can read Joe Serna's take in the Daily Pilot HERE and Jon Cassidy in the Register HERE. Each has a little different perspective on the story. In fact, there will be lots of stories on this event - the media was everywhere, including two television news vans, photojournalists from the OC Weekly and the ubiquitous Register columnist, Frank Mickadeit, who arrived late and left early. OK, I gues s we should just cut to the chase.... The meeting last night was both wonderful and terrible. It brought tears of joy and just plain old tears of frustration and pain. It played to a packed house, with every seat filled until the clock headed past 11p.m. More than a hundred brave souls hung in until the end of the discussion of the Outsourcing issue. One person commented that we hadn't seen this kind of media attention since then-mayor Allan Mansoor tried to solve his "illegal immigrant" problem by attempting to make every Costa Mesa cop an immigration screener four years ago. THE BEGINNING OF "ROEDER WEEK"
As anticipated, the recognition given to retiring City Manager Allan Roeder and resigned City Attorney Kim Barlow was terrific. 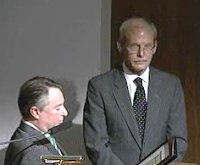 All the tear-filled kudos given to Roeder by speakers were certainly well-deserved. It began an hour earlier in the lobby of City Hall where friends and current and former colleagues toasted him with cookies and punch and had a chance to wish him well. It was a nice beginning to what will be a whirlwind week of celebrations for him. While I hated to see him go, I could see the weight lift off his shoulders as he walked up the center aisle of council chambers, shaking hands with well-wishers as he carried out the proclamations, placards and gifts presented to him - including one hand-delivered and personally presented by now-Assemblyman Mansoor. I hope he and his lovely wife drove to some exotic venue for dinner and never turned on the television again last night. The council meeting itself was another matter all together. Some of the early items went well, including the official swearing-in of Thomas Duarte as the new contract City Attorney. Roeder, before he waltzed off into the sunset, provided an update on the current situation with the Orange County Fairgrounds. At this point nothing is happening until after the next court date near the end of this month. Steve Mensinger requested the ROCKS program issue be continued so he can get together with staff and former council woman Katrina Foley to study the issue more. The change of the name of the City Manager to Chief Executive Officer of the City was approved - an unnecessary bit of fluff designed so Mensinger can show his mark on our city to his grandkids, I guess. 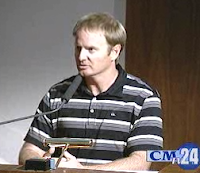 The council also approved the new ordinance requiring a permit for certain masonry walls. The evening really started popping, though, when the discussion turned to Mayor Pro Tem Jim Righeimer's latest scheme - to send a letter to the head of the County EMS program asking for an assessment of possibly adding "enhanced" EMS service in Costa Mesa to supplement - not replace - our current ambulance program. Several residents stood to question the need for this initiative, most expressing concern about the costs - both to the city and to the residents who would use a private ambulance service. Costa Mesa EMS Coordinator Larry Grihalva spoke a couple times with knowledge and passion. He told the council that he was surprised that neither he nor acting Fire Chief Kirk Dominic had been contacted about this plan, since he - Grihalva - was the repository of information that would have been valuable to the council (Righeimer) BEFORE he launched this effort. The council voted 4-1 (Wendy Leece voting NO) to send the letter that will start this particular snowball rolling down hill. Let me pause here and state that throughout the evening, on the EMS issue and the Outsourcing later, it appeared that most members of the council already had their minds made up on the issues and didn't really want to be bothered with the FACTS. Speaker after speaker - including many highly respected former senior staff members and elected officials - and urged the council to slow down a little before they dismantled a city that has taken more than 60 years to build. Those warnings were barely acknowledged and uniformly ignored. Finally, at 9:40 with the auditorium still packed, the council got arou nd to the discussion of the plan proposed by Mayor Gary Monahan and Righeimer, as the Budget Work Group, to outsource the jobs of eighteen city functions (so far). Estimates vary about the number of staffers that will be affected. The Register says "half the staff". The Pilot says 150. The truth is, NOBODY knows today exactly how many staffer's jobs are in jeopardy, although it's pretty easy to count heads in certain departments - especially when part of this equation is, for example, dumping the entire Fire Department and support staff. 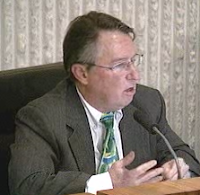 Based on my conversations with folks Tom Hatch, Assistant City Manager until Saturday when he becomes CEO, led the discussion with a refresher on the fiscal condition of the city, then Monahan and Righeimer gave us their reasons for throwing the entire city staff into turmoil. I'm not going to try to q uote every single speaker in this discussion, but a few comments were especially noteworthy. 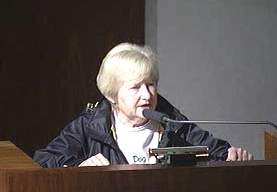 For example, Helen Evers - who told us she'd lived in Costa Mesa since 1958 - was one of several speakers who spoke with passion about the possibility of outsourcing the Animal Control operations. At one point, in response to statements made earlier by council members that they wanted community input, she cautioned the council with this admonition, "You don't ask for ideas if you have no intention of using them." 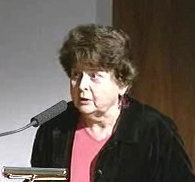 Her opinion was based on prior experience with councils in the past. Perry Valantine, who retired after an illustrious career in the Planning Department, wore his "funeral suit" because he feared he was seeing the death of the city as we know it. He encouraged the council to look beyond "the bottom line", to look at both sides of the issue and asked whether there had been a study done to get to the list of probable outsourced departments. (The answer, not given, is NO) He expressed concern about bumping rights - which must be exercised by staffers WITHIN FIVE DAYS of receiving a layoff notice and was very concerned that the council seems unwilling to wait for answers before making decisions. 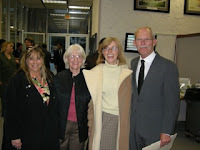 Eleanor Egan, a former at torney in the City Attorney's office and planning commissioner following her retirement, reminded the council that "City government is it's people". She went on to say, "Outsourcing is an amputation - replacing a living limb with a wooden leg." She ended by looking squarely at the council and said, "Yes, I'm angry! And if you go ahead with this you should be ashamed!" 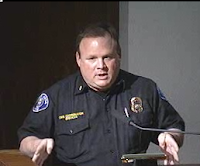 Tim Vasin, president of the Costa Mesa Firefighters Association, steppe d up and clarified the genesis of the Request for Proposals for the Orange County Fire Authority presentation. Righeimer had earlier waved a copy of the proposal in the air, stating that "We didn't ask for this, you did!" Vasin reminded the council that his organization agreed to pay for the RFP as a data-gathering tool with which city and fire department management could analyze city fire operations, looking for efficiencies. He emphasized that the OCFA proposal has huge holes in it and, at the end of the day, his organization could still reject it. Throughout his presentation Vasin told the council that he and his firefighters want to be part of the solution, not part of the problem. At the end long time employee Billy Folsom reminded the council that employees had presented a list of 120 suggestions early in the process of trying to identify potential budget savings, and that they were rejected in total. He reminded the council that the bargaining unit asked what they could do to help and the city gave them a list - and that the employees did EVERY ONE - met every request, every concession. He, as much as any speaker before him, reflected the frustration being experienced by city employees since the announcement of this outsourcing list last Friday. He reminded the council that a study was done recently of the graffiti removal operations that showed the city staff does it cheaper than other options - and yet it appears on the list. Same with the street sweepers. The predominant opinion among those with whom I spoke was that this is a done deal and that they really have no voice in the outcome, regardless of the facts presented. Righeimer only added fuel to that fire when he said, "...it's disappointing w hen people make insinuations about what people's motives are. And I think the first step to working forward is not to do that." That's an indication of the arrogance this man brings to the party. He wants you to blindly accept his ideas even though there is no evidence of any kind of an analysis that brought him to his conclusions. 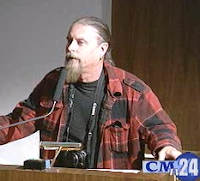 Earlier he looked out at the packed auditorium and commented that Costa Mesa is a city of 116,000 people and yet only around 200 are here tonight, and most of them are employees, implying that the remainder of the population of the city fully supported what the council was doing, or they'd be here to comment, too. Give me a break! He feels that, because he received 31% of the votes cast in the last election, he has a "mandate" to run roughshod over the city. He conveniently ignores the fact that 69% of the votes cast DID NOT go for him. Those of us who pay attention saw Righeimer campaign on a platform of "pension reform" - the mantra handed down from the Orange County Republican Party which he blindly follows. We heard him, in the very first meeting at which he was a council member, tell us that he wanted to look at "every job" in the city that could be done by someone other than city employees - outsourcing. Since he won't be able to effect "pension reform" the old fashioned way - by negotiating with the employees - he's taking the easy way out and is going to simply just dump them in favor of low-bid contractors. All this to polish his political resume to grease the skids to his next jump to higher office. The man has no shame! Sadly, it was no surprise when the council voted 4-1 to approve the motion, which will result in layoff notices being presented to roughly a third of the city staff in the next couple days. That will trigger the chaos of 'bumping" for the next week and turn City Hall into a game of dodge ball as employees jockey for position to stay employed. I had to smile when Monahan, trying to justify his concern for our budget si tuation and to provide some perspective, referred to me by name from the dais, indicating that I had been critical of him inserting himself into budget deliberations before he was actually sworn-in when he was elected the last time. You can read what I wrote at that time HERE. I guess he does read this stuff - and remembers, too. OK, BUT WHERE'S THE MONEY COMING FROM? Once that issue was put to bed the chambers emptied as if someone had pushed the plunger on a toilet and the angry discussions spilled out onto the council chambers porch. Those few of us who remained for "council member comments" heard Bever use his bully pulpit to bad-mouth former mayor Sandra Genis for her vocal positions expressed that evening. We also heard Steve Mensinger ask Hatch to "find a consultant to score our pensions once and for all." Bever asked Hatch "to get some bids for doing a transition audit. I'd like us to bring in one of the Big 8 firms and basically do an audit of our entire operation financially. That would also include a payroll audit." Funny, I didn't hear any discussion of where, in this time of financial crisis in our city, the money for the consultant and audit will come from. WHAT'S BEVER UP TO NOW? 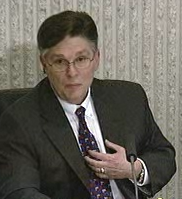 Bever also asked for "all documents that were pertinent to the PERS increase for general employees." Since he has demonstrated no skills with complex financial issues and has, in fact, engaged in a personal boycott of many of his duties in a fit of pique, it makes one wonder just what mischief he's up to with this request since that ship has sailed. I think it's safe to say that every city employee, and most of the rest of us, too, in attendance last night left feeling very frustrated by this process. It was clear to us that this council has little regard for community input. They barely tolerate it and, in the case of Bever, openly criticize speakers who take the time to present their views. 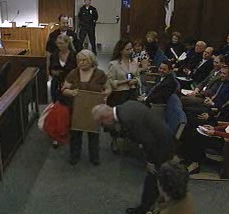 You could almost feel the civility, transparency and professionalism being sucked out the door as Allan Roeder left the chambers. We have entered an era when what is good for the city becomes subordinate to the political dogma of regional and national parties and the political future of council members. We are being "led" by men who think that, because there are not 116,000 people in the streets with pitchforks and burning torches opposing their actions, they have an unquestionable mandate to impose their collective will on the populace. We don't have a city council any longer - we are being governed by a junta. Geoff...I think its been mentioned here before but here is a link to a list of Righeimer's campaign contributors. If you look down the list you will see Care Ambulance on it...Funny how Righeimer now wants to put paramedics on Care ambulances which would mean more money for Care Ambulance. Looks like a classic case of "you scratch my back and I'll scratch yours." Both Larry Grihavla and Allan Roeder have made statements to the effect that the CARE Ambulance service is free to residents. However, nothing could be further from the truth. I just double checked with a neighbor who had paramedic/ambulance service recently. He said he was charged $300 for the service and warned that his account would be turned over to a collection agency if he did not pay. Why can't you city employees get your stories straight? 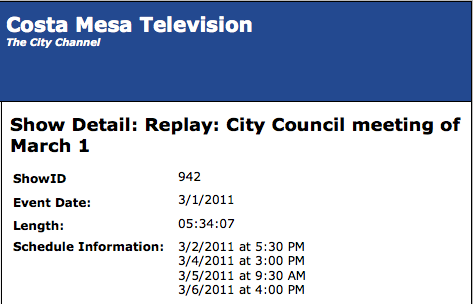 Geoff, as you know, I don't live in Costa Mesa anymore, but I was there at the meeting to show that I care for this city. I just feel sorry for so many American families who won't have a major source of income. Care gave money to Riggy. Employee associations spent thousands on Leece. Both voted along those lines. Bever did not "bad mouth" Genis, he pointed out how she had failed to act on a certain item when she was on council. Leece "suspects" this is about saving money. No joke Sherlock. Leece says she is tired of public employees being denigrated. I have not heard any derogatory remarks about the employees have you? The fact is that they outnegotiated the city for so long they killed the goose who lays the golden egg and the money is gone with a lot more due soon. Genis goes 0 for 3 and continues her hitless streak. THE COST is for out of town residents. Geez.. do your homework. Did you attend the City Council meeting? If you did you would have heard the details. Quit spouting hate idiot. Why show up to a meeting if no one is going to listen? As the move to privatize EMS goes forward people are going to hear over and over again that the high cost of employing a FF Paramedic, when you can get a private version of the "same thing" for a third of that, is obviously a valid reason to do it. You'll hear that private medics have exactly the same training and education and can be had for a third of the cost. First... Yes the paramedic schooling is the same. It is controled by county and state requirements. When it comes to doing the job of a medic, I will not say that any of the privately employed medics aren't up to doing that job. However... there is a lot not being said with this simple math approach. One.. the firefighter is also a FIREFIGHTER. He's doing both jobs. The medic part of the job is being done for nothing more than a 5 to 10% increase in the pay that individual already gets for being firefighter. If you eliminate the paramedic part of EMS from the fire service completely, you still have not eliminated that position. You still have to have the same number of firefighters to do the fire fighting part of the job. Fire Depts throughout the county are at minimum staffing levels already and these medics are not 'in addition' they are a 'part of' the minimum number of people that need to be at work to make it work. So.. Down the road you have private medics! Have you really reduced staffing levels and saved money? No. What you've done is eliminate one of the things your Fire Dept does, without reducing staffing levels at all. You've eliminated the 'medic bonus pay' that a few of the firefighters make for being paramedics. Peanuts!! Not a problem, you made a point, right? Maybe. Depends on what kind of problem you're having. Stop and think about this. How many of those ready to respond paramedic ambulances are these companies are going to have stationed around Costa Mesa? Are you going to get one in 5 minutes or less? Let me answer that for you. NO. Regardless of what they tell everybody when they're trying to sell this, the real answer is somewhere between 10 to 20 minutes. Remember that these ambulances transport every patient they see. That's how they make their money. They are out of service during that time. Wait! There's more. Most people don't have a clue how EMS works throughout the county. 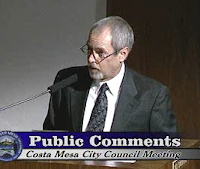 Cities like Costa Mesa have mutual aid agreements with neighboring cities like Newport Beach. Emergency responses across city boundries are a regular part of the program. You'll get Newport responding to calls here in CM and vice-versa. These agreements have been worked out over time and are programmed right into first responder dispatching. Now CM is eliminating at least one fire station. The sales pitch is that they are going to reduce response times by doing that. Really! Think about it! Maybe when 2x2 equals 5. In reality, Newport is going to be required to increase their mutual aid coverage to take up the slack that less fire stations in CM causes. Who knows, maybe they'll be happy to do it! Good neighbor and all that. Newporters are all rich and won't mind paying for some of Costa Mesa's services will they. That is until Costa Mesa tries to include those private ambulance company medics as their part of the "mutual aid" agreement! 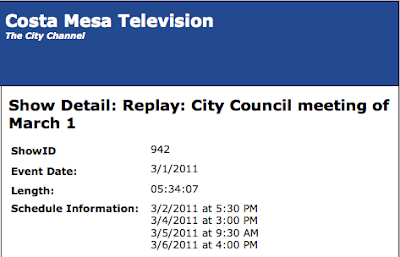 Can't wait to hear that one get started in the Newport Beach city council meetings. Ok, last but not least.. Back to the "depends on what kind of problem you're having". FD medics have response time maximums in the 4 to 5 minute range. Often times you'll get one in less which is incredible if you think about it. It has taken a lot of organization and planning to accomplish that. If you have a booboo, a 10 to 20 minute response time is ok. It's not going to make any difference. If you are having a heart attack and are going to go into cardiac arrest in the next 5 minutes... you're dead. Think about that and then go to the NEXT city council meeting. Thanks for the link. Care apparently contributed $249.00 - one buck under the limit where it becomes a conflict. Pot stirrer - Care Ambulance also donated $5000. to Orange County Republican Party on May 27, 2010 as well. I suppose that's not a conflict either? Sad for Costa Mesa, I don't make the rules. I do know that $249.00 number is the cutoff point. If they'd contributed $250 or more to Righeimer he would have to abstain from deliberations and votes involving them for a period of time. Nothing to keep them from contributing $5,000 to the OC GOP and have some of those dollars filtered to Righeimer. That's the way it is.. The other day a character tried to give you grief for doing this blog and not speaking up at council. Sweetie, your ignorance is positively, absolutely, overwhelming ..... let me educate you, if I may. The fire department's paramedic charges are only for out of town residents. However, the CARE Ambulance that accompanies them charges almost a thousand dollars for nothing more than a ride to the nearest hospital. Then, if you don't pay them promptly, they will, and do, destroy your credit. They won't make payment arrangements, and they don't care if social security is your only income. That's probably why they named themselves "CARE" Ambulance Service. In other words, they don't "care" about the patients they tote around in their ambulance. They only "care" about their bottom line. Most people who have been hauled to a hospital by CARE Ambulance would rather die than get there that way again! However, if you are ever brave enough to dial 911, you will be forced to get there by CARE. You will have no other choice. My neighbor was charged almost a thousand dollars for his joy ride (and his wife got to the hospital way before the CARE ambulance did), and after his medical insurance paid their share, CARE forced him to pay the $300 he complained about. When he tried to pay CARE in $100 incremental payments, they immediately turned his account over for collection, thereby destroying the good credit he had built up over his lifetime. Can anybody tell me why the fire department can afford all kinds of fancy fire trucks, but they can't afford to buy a simple ambulance? CARE Ambulance definitely needs to be replaced by some other means of transportation. Elderly patients don't want to dial 911 anymore. Walking into the council chambers I had to do a Double-take to see if it said City of Bell... or City of the GOP.... nope. It said City of Costa Mesa. Watching the council meetings are beyond painful. You listen to the citizens speak and the employees speak but all the Council hears is their own agenda ( at least 4 of 5). I am really surprised that Righeimer, Bever and Mensinger's chairs don't break from the weight of their egos. Mr. Righeimer only got 10% of the public to vote for him, and only 2000 votes more then Mcevoy. 2000 votes !!! And unlike Righeimer, Mcevoy is not a PROFESSIONAL POLITICIAN and only had 1/20th the financial campaign budget and certainly not the COMPLETE BACKING OF THE GOP. STILL only 2000 votes changes the council completely. No Righeimer and no appointing his buddy Mensinger. Not quite the Mandate now, is it. To think he is doing what the public wants, is flat out wrong and almost dilutional. The City is NOT imploding, the Sky is NOT and the finances are not as bad as they are making out to be. They are simply making numbers up to justify their agenda. $10 million for streets?, $70 million or $20 million for sewers ? ( cant remember what fib they settled on ) is nothing more then yelling FIRE in a crowded movie theater. Its designed to cause panic. Maybe next meeting Mr Righeimer can ask for millions for a Railway in the city and justify more cuts. In my opinion they are doing things so fast because they want things implemented before the financial numbers show everything is OK. It would be a harder sell for the other 103,000 citizens that didn't vote for Righeimers. It has become too clear to me that decisions and votes are predetermined far in advance. The GOP playbook is being run and Mr Righeimer is checking them off one by one. Just look at Care Ambulance. The fact that they donated $1 less then the "conflict of interest" limit speaks for itself. Listen to your citizens. They are talking, in fact Begging you to do the right thing. Care is NOT free!, your opinion is the opposite of what was presented last night. It's my understanding that no Costa Mesa resident will be pressed for additional charges if transported by CARE under our contract. I'll try to get a clarification tomorrow. 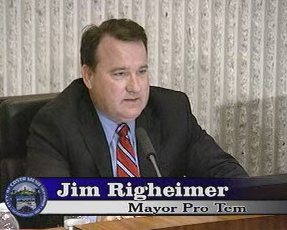 If the the Rim Jigheimer supporters and Jimmy Boy, Smooth Stevie are SO concerned about whether employees live in the city or not, and are so ready to dismiss the opinions of employees because they don't live in the city; will all of the outsourced companies be Costa Mesa based companies? Will the employees of those companies live here? Just a question. They SAY the voices that count are residents. The only voices that count to them are the residents in their "circle of trust". How about business owners in the city? Do they count? I mean after all, the are the job creators and employers in the city. If they count, do they count less if they only have a business in Costa Mesa, but live in say, Fountain Valley? It takes more than residents to make a "community". Community is the people who live here, the people who work here, the people who do business here. There are many sides to the equation. WHO is David Coppock? Ive, done two days of research and no one one knows this guy. He looks like another Riggy plant. These council nut jobs feel they have to plant supports with made up names to prove their craziness. Paul P., I'm not sure that's how he spells it, but I know the fellow you refer to. He, and couple others who all sit together, have begun appearing at council meetings to make "pro-regime" comments. I suspect the power on the dais have recruited them to make their comments - otherwise all they would hear is criticism - much-deserved criticism, by the way. Good catch. The decision has bveen made, deal with it. The best thing the employees can do is prove to the council that outsourcing will not save money or best serve the citizens. Making threats and calling names is incredibly stupid and reinforces the decision to outsource. The majority of citizens that I know don't want to see this strife, they want their own police and fire, and they want fiscal responsibility. To avoid outsourcing, show how you can do it better, and why. Coming up with new fees for residents and businesses is not the answer. I say let's skip the recall and handle this the old fashioned way. Tar and feather them and run them out of town on a rail. They need to be publicly humiliated! 1862, as much as that thought puts a smile on my face, it's hardly a solution and - did you know that it's a felony to threaten a public official with bodily harm? Learn the facts from the people who manage the system. I was not trying to imply any bodily harm. I was trying to make the point of publicly embarrassing them to the point where they would leave town.